The imagery of my shoulder. Click on one of the links below to go to a separate web page with the series of images for each view. Each link opens in a separate window. You will then see all of the images from that view at small size. Click on the first image (top left) and you will see above it a ‘next’ link. Click on that and you will see the next image in the series. You can go through each of the images in each series that way. 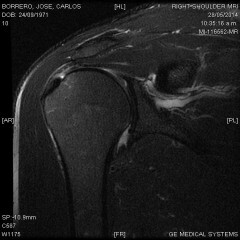 This entry was posted in Uncategorized and tagged injury, MRI, old, ouch, shoulder on June 12, 2014 by jocabo.